Not to be confused with André Riou. André Léon Marie Nicolas Rieu (born 1 October 1949) is a Dutch violinist and conductor best known for creating the waltz-playing Johann Strauss Orchestra. He and his orchestra have turned classical and waltz music into a worldwide concert touring act, as successful as some of the biggest global pop and rock music acts. He resides in his native Maastricht. The name Rieu is of French Huguenot origin. André was born to Andries Antonie Rieu and his wife as the third of six children. He has two older sisters (Teresia and Cilia), two younger brothers (Robert and Jean-Philippe), and a younger sister (Gaby Buirma-Rieu). Rieu's father was conductor of the Maastricht Symphony Orchestra. Showing early promise, André began studying violin at the age of five. From a very early age, he developed a fascination with orchestra. He studied violin at the Conservatoire Royal in Liège and at the Conservatorium Maastricht, (1968–1973), studying under Jo Juda and Herman Krebbers. From 1974 to 1977, he attended the Music Academy in Brussels, studying with André Gertler. He completed his training with the distinction "Premier Prix" from the Royal Conservatory of Brussels. He married Marjorie Kochmann in 1975. She has been a language teacher and has written compositions. They have two sons Marc and Pierre. He speaks five different languages: Dutch, English, German, French, and Italian. While at university he performed the Gold And Silver Waltz by Franz Lehár. Encouraged by the audience reaction, he decided to pursue the waltz form. Rieu created the Maastricht Salon Orchestra in 1978, and served as violinist with the Limburg Symphony Orchestra. In 1987, he created the Johann Strauss Orchestra and established his own production company. Since then, his melodramatic stage performances and rock-star demeanor have been widely associated with a revival of the waltz music category. André Rieu plays a 1667 Stradivarius violin. Rieu created the Johann Strauss Orchestra in 1987 and began with 12 members, giving its first concert on 1 January 1988. Over the years it has expanded dramatically, nowadays performing with between 50 and 60 musicians. Rieu and his orchestra have performed throughout Europe, North and South America, Japan, and Australia. The size and revenue of their tours are rivalled only by the largest pop and rock music acts. In 2008 Rieu’s extravagant tour featured a full size reproduction of Empress Sisi’s Castle, the biggest stage ever to go on tour at that time. 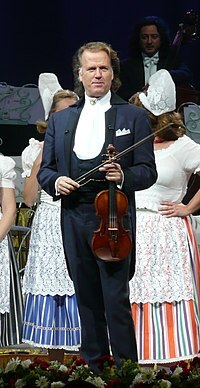 During the first half of 2009, André Rieu was the world’s most successful male touring artist, according to Billboard magazine. Rieu records both DVD and CD repertoire at his own studios in Maastricht in a wide range of classical, popular, and folk music, as well as thematic music from well-known soundtracks and musical theatre. His lively orchestral presentations, in tandem with effective marketing, have attracted worldwide audiences to this emergent subgenre of classical music. In addition to two World Music Awards, Rieu's recordings have gone gold and platinum in many countries, including 8-times Platinum in the Netherlands. Television is also an important outlet for Rieu and his orchestra. Their annual New Year's concerts from Vienna have become a Holiday tradition on public broadcasting stations. For two weeks in 2013, one of the channels of the BSkyB group, Sky Arts 2 in the UK, was renamed as Sky Arts Rieu. Between 30 March and 14 April 2013 Sky Arts Rieu broadcast Rieu concerts and documentaries 24 hours per day. In spite of its wide international success, Rieu's mix of waltzes, popular music, comedy, and pathos has attracted its critics. Chris Boyd, a critic writing for Melbourne's Herald Sun newspaper, did not criticize his playing, but described his main stage function as "blarney and delegation". Of Rieu's popularity and the media debate surrounding him, Eamon Kelly wrote in The Australian newspaper: "It is disappointing to see professional journalists indulging in cheap, inaccurate stereotypes to dismiss criticism of Rieu." But he goes on to add: "Equally misguided are those who cursorily dismiss Rieu. Rieu's live and recorded performances have brought joy to millions of people. Few in his audiences are regular classical music attendees and it could be seen as promising that, via Rieu, they are listening to standards of the classical canon. The fact that Rieu's focus is on highly accessible, enjoyable repertoire is not an argument against his musical credentials." ^ a b "international Archives – Page 2 of 3 – Andre Rieu". Andrerieu.com. Retrieved 2016-01-15. ^ a b Rieu, André. "André Rieu Biography". www.andrerieu.com. Retrieved 2018-01-01. ^ a b "Interview on German TV". Archived from the original on 21 July 2011. Retrieved 30 Aug 2011. ^ a b Sonja. "Andre Rieu and his family". www.andrerieutranslations.com. Retrieved 2018-01-01. ^ "André Rieu". classicfm.co.uk. Retrieved 2012-01-28. ^ a b "André Rieu: ten things you never knew". Classic FM. Retrieved 2018-01-01. ^ a b "Andre Rieu is top 10 Touring act". Andrerieu.com. Retrieved 2016-01-15. ^ "Year End Top 100 Worldwide Tours" (PDF). Pollstar. Retrieved 2018-04-03. ^ "Charts – Year End". Billboard. Retrieved 2017-01-08. ^ "Top 25 Tours" (PDF). Billboard. Retrieved 2017-01-08. ^ "Top 25 Tours of 2015". Billboard. Retrieved 2016-06-23. ^ "Top 25 Tours of 2014". Billboard. Retrieved 2016-06-23. ^ "Top 25 Tours of 2013". Billboard. Retrieved 2016-01-15. ^ "Top 25 Tours of 2012". Billboard. Retrieved 2016-01-15. ^ "Top 25 Tours of 2011". Billboard. Retrieved 2016-01-15. ^ "Top 25 Tours of 2010". Billboard. Retrieved 2016-01-15. ^ "Top 25 Tours of 2009". Billboard. Retrieved 2016-01-15. ^ "Andre Rieu Concerts, Documentaries And Pictures". Skyarts.sky.com. Retrieved 2016-01-15. ^ a b "Music's Great Polariser". The Australian. Retrieved 2016-01-15. 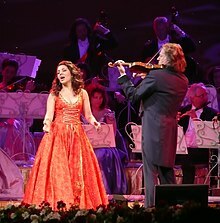 Wikimedia Commons has media related to André Rieu.